My recent experience at http://www.thenextbigwriter.com has been an eye-opener. 1. When you post your story in a place where other writers will actually review it, you discover a new level of objectivity. I can’t describe it, but it’s unlike writing for a vague audience that you hope to someday obtain. The feeling brings new creative energy and you can hear your dialogue better than you’ve ever heard it before, at least initially. Maybe the effect wears off after a while, I don’t know. 2. The opportunity to read the work of numerous other writers in various stages of development is a nice learning experience, generally available to creative writing instructors and no one else. Seeing how other people write gives you a feeling for where you are as a writer. It’s not black and white, but it’s useful. 3. If you have political ideas that are conservative and you let them creep into your story, it will probably reduce the number of reviewers who will read your work, because most highly educated, highly intelligent, creative people in the US seem to be liberal, and tend to see conservatives as crazy, dumb and/or evil people of the supposedly selfish, ignorant, ill-informed, racist “far right.” It’s too bad the US is so viscerally polarized, but don’t let it reduce the amount of help you might get from the great talent and wonderful people on http://www.thenextbigwriter.com. 4. I’m no expert on friendship, but I get the feeling that it might be possible to develop true friends on this site. 5. To me, the most important thing I’ve “learned” so far is that there are three excellent writers who think that the first two chapters of my story are pretty good. One of them said, “Me thinks you’ve got a unique narrative VOICE, Talmage!” When I read this I hugged my puppy, Halo, and almost cried. Well, actually I did cry just a tiny little bit, but I’m such a manly brute I stopped almost immediately. Almost. 6. Here’s a point I wish I’d known before I joined: Although you can submit a chapter with up to 5,000 words, you should try to keep it under 1,000 if you want anyone to review it. At least that was my experience. I had my first chapter (of 5,000 words) posted for many weeks without a single review. I was so discouraged I felt like I had to face up to being a zero talent in terms of fiction. When I chopped the first chapter up and posted a first chapter with less than 1,000 words, I got several reviews within a couple of days. The reason for this has to do with the point system. You need points before you can post your work, so it’s easier to get points by reading shorter things. Incidentally, I think the quality of my writing went up a little when I divided it into smaller sections: more focus per unit, I guess. No disclaimer: I don’t have any conflict of interest in encouraging you to try out http://www.thenextbigwriter.com. I’ll keep you posted if you’ll just keep writing. Come on, you got to promise me you won’t give up! Way off subject: That’s a picture of my puppy, Halo, at the top. We got her as a tiny pup from a top-notch breeder who shows dogs professionally. We had to sign a contract saying that we won’t show her (because we’re not pros) and we won’t breed her. Also we can’t have her spayed until she’s one year old. Halo is now a 9-month-old Labrador Retriever of the British variety (as opposed to the “Working American” type of Labrador Retriever.) Incidentally, some breeders believe that the two types of Labs should be separated into two separate breeds because they are quite different emotionally and physically. My departed Cortana, a Working / American Lab was more athletic, needed more exercise, had a bigger chest and narrower waist, was taller with longer legs, was afraid of strangers and had an emotional presence that made it seem like someone was inside her who had loved you for eternity and was always beside herself with joy because she’d finally found you again. My little Halo, a British Lab, is calmer, gives less sustained eye contact, loves everyone exuberantly and exactly the same amount (including strangers), and is easier to train. I think she came out genetically potty trained. She still won’t go to the bathroom on walks. (She only goes in our back yard). 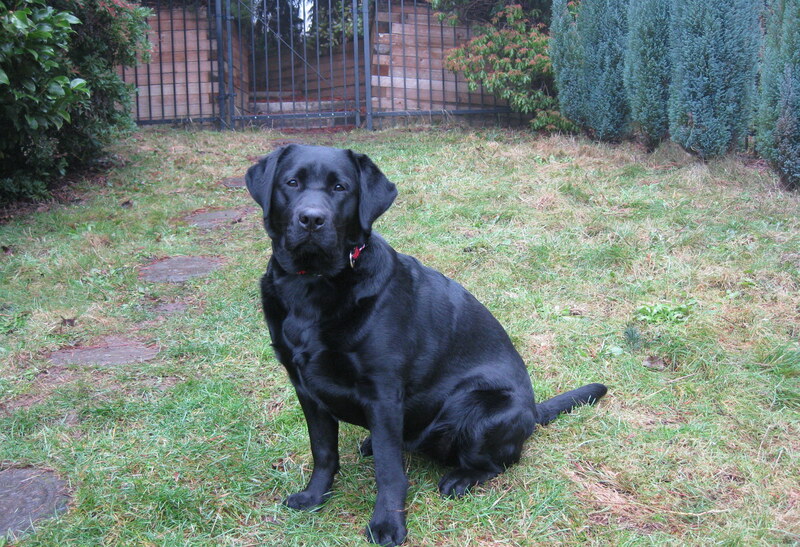 I have read that many people who buy a lab are expecting a calm indoor dog who is good with small kids and will be content to lay by the fireplace for hours… and when these people get an American Lab they are shocked to find they’ve got a different creature entirely. From my experience, I think this is likely true. Do your research before you buy your Lab. But please, get yourself a Lab. You deserve to be loved at warp 9.